Our new WooCommerce App will help you import products from drop shippers into your WooCommerce store with almost no effort and with no technical knowledge. Just choose the products you want to import from our list of over 1 MILLION dropship products and build your list. Then just turn ON your list and watch your WooCommerce store get loaded with products including images, descriptions, prices, inventory, etc... You won't have to worry about importing files manually every day to keep your store up to date. All this will be done automatically for you. There is a limit of 10,000 products per account. A limit is imposed to avoid having everyone flood WooCommerce with the same products. Which version of WooCommerce should i be using? If you have mod security module enabled for APACHE server, make sure server supports PUT, POST and DELETE. Many servers have PUT, POST and DELETE blocked for safety. Do you also import the product images to my WooCommerce store? Yes we do. 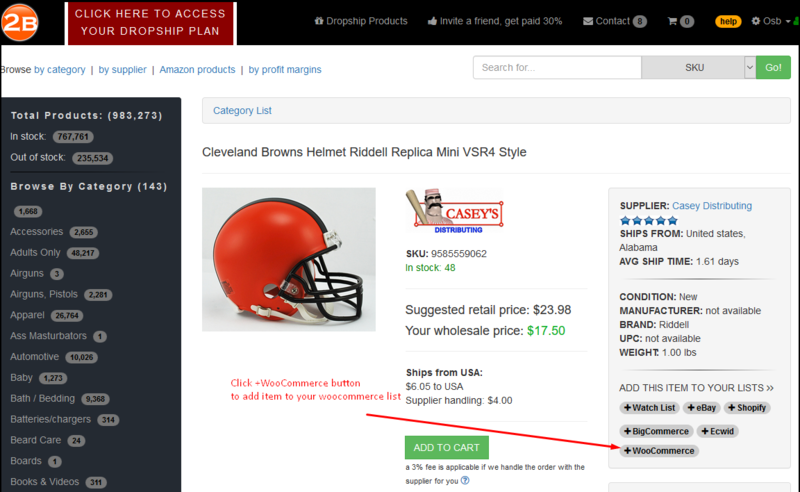 The product images will be loaded to your WooCommerce store when your list is imported to your store. Will the inventory on my store be kept up to date? Yes. Every products on your list will be pushed every day to your WooCommerce store so any changes made to any items on your list will be kept in synch with your store. This includes quantity in stock, pricing, name changes, removal of products, etc. Can I make changes to the item names? Yes, you can. You can edit the item names and descriptions directly from your list. This is a great way of making the items unique on your site which will help get better SEO. Please note that all changes need to be done direclty on your list because your list is considered as your main source. If you change the prices, or item names or item descirptions directly from your store, then those changes will be overwritten by your list the next time it is synched. How many items can I add to my WooCommerce list? During the free trial you can only add up to 10 items however you can increase this limit to 10,000 by activating the plan immediately instead of waiting for the 7 days free trial to end. Once the plan is active, we allow up to 10,000 per list however you can increase this limit. The cost is only $27.99/month to increase your limit by 10,000 items. You can get this upgrade as often as you want to further increase your product count. Do I also need to pay WooCommerce for the store? Yes you do. The fee for our WooCommerce App does not include the WooCommerce store. Our WooCommerce App requires that you already have a store with WooCommerce. Who will be handling the billing for your WooCommerce App? The billing for our WooCommerce App will be handled by Wholesale2b. After your free trial is over, we will charge you the monthly fee. Do I need to manually input tracking codes? No you do not need to manually input tracking codes. Once your order is shipped, we will send the tracking code back to your WooCommerce store and your order will be marked as shipped. This will be done automaitcally for you. Do I need to manually input my orders? No you don't have to manually input your orders. Your orders will automatically be imported into your Wholesale2b account. You simply need to click on the ORDER NOW link located next to each new pending order. Please make sure that you do not change the status of your orders to shipped. You must let our sytem change the status for you. When you get a new order you simply need to about until it is imported into your Wholesale2b account, and click on the ORDER NOW link to complete the wholesale payment. New orders are usually imported every 3 hours. How quickly will I get the tracking code? 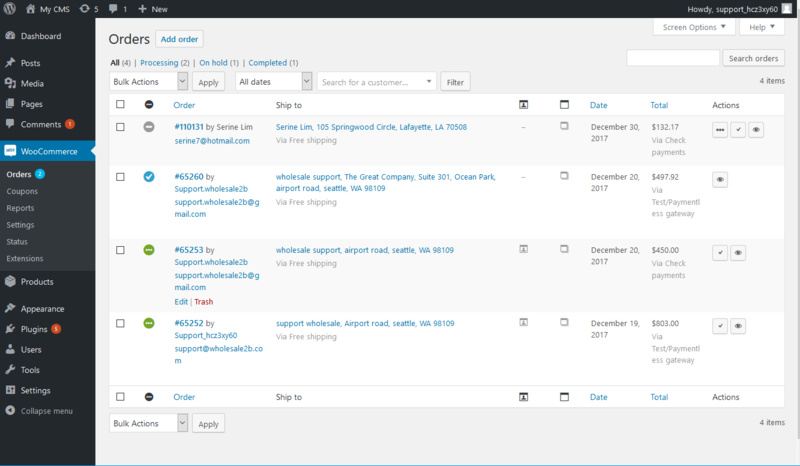 Tracking codes are provided by the suppliers after the order is shipped. Some suppliers are quicker than other however on average you can expect to get the tracking codes between 1 to 2 business days. 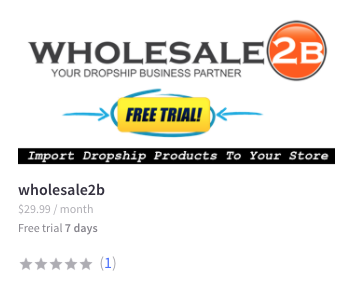 How To Install Wholesale2b WooCommerce App? How To Cancel Dropship WooCommerce App? How To Add Products To Your WooCommerce List? How To Manage The WooCommerce Category Names? We offer product sourcing, order fulfillment, handling of returns, listing tools for eBay, Amazon, WooCommerce, Shopify, E-commerce sites and data feeds for marketplaces & shopping carts.